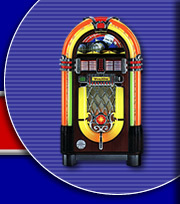 Here's a Wurlitzer with quality sound that'll make you twist and shout! 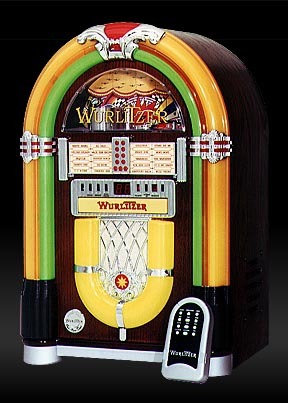 Relive malt shop memories and relish in bobbysock reveries with the Wurlitzer Mini Bubbler CD player. At 18' tall, this compact sound system is perfect for bookshelf or tabletop use in your home or office. 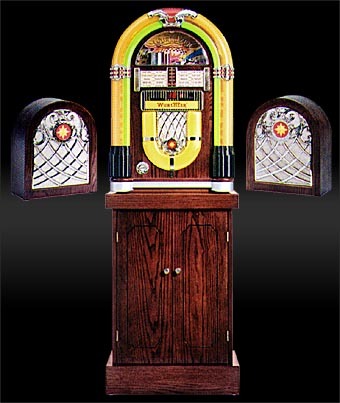 While glowing neon columns produce a rainbow of dazzling colors, those famous Wurlitzer bubbles merrily percolate, producing a nostalgically hypnotic effect, just like the original 1946 Wurlitzer Model 1015. This authentic Wurlitzer offers pleasure for the eyes as well as the ears.